What comes to your mind when you see a group of ugly monsters? Expect nothing, but an Ugly Invasion! Inflate monsters by holding a mouse button and fill the area on the screen. 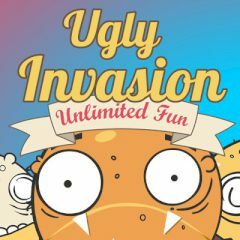 Ugly Invasion is a game where you have to take control of the territory on your screen. Inflate the monsters and make sure the guards won't touch them. Choose the best position and the time to inflate another monsters and make him as big as you can. Release the button when it's enough of him and get three stars.